News & Updates A Review from SciFi and Scary! A Review from SciFi and Scary! Want to know if this book is any good?! Check out this review by Lilyn G. of SciFi and Scary! “I love the cover for Lilac Skully and the Haunted House. The house is definitely suitably creepy, and the color choice for the sky is absolutely gorgeous. I did pick it up just to look at the cover more than once before it made it’s way to the top of my to-read pile. And at only 168 pages, when I finally did pick it up to read, it was a book that I flew through. Obviously it’ll take the intended age range a bit longer to read than it did for me, but I can’t imagine it being a slow go for anyone. It’s well-written and nicely paced. The story hits the ground running. I liked Lilac Skully and the Haunted House. Lilac reminded, at least vaguely, of Luna Lovegood from the Harry Potter series. Not as crazy, mind you, but with the blonde hair, the big eyes, and the outcast status, it was hard for her not to feel a little familiar. This was a good thing, as it enabled me to immediately connect with the character a little more quickly than I might have normally. The fact that Lilac was scared of ghosts was perfect. Young readers will definitely be able to empathize with the little girl who does all the sensible things to avoid running into them. Who in their right mind would want to go into a haunted basement, right? The set up is fairly typical of a kid’s book. A single parent family, with the father additionally and conveniently absent for the majority of the book. The adults that are in the picture for Lilac Skully and the Haunted House are bumbling, sometimes up to no good, and ridiculously easily fooled. Nothing new to see, but still entertaining to read. The formula works for a reason, even if we do celebrate times when things veer from the norm. In this case, it allowed Lilac to participate in some Home Alone-esque shenanigans that had me grinning. It’s obvious the author has more adventures for Lilac Skully planned (seven, to be exact), and I think she will swiftly gain a loyal fanbase. Lilac Skully and the Haunted House was easy to read, and featured a little girl with a lot of heart. I enjoyed watching Lilac learn that appearances can be deceiving, and that sometimes the people you least expect can become your best friends. Overall, a very good read for young readers who want something with ghosts, but not something ‘too scary’. 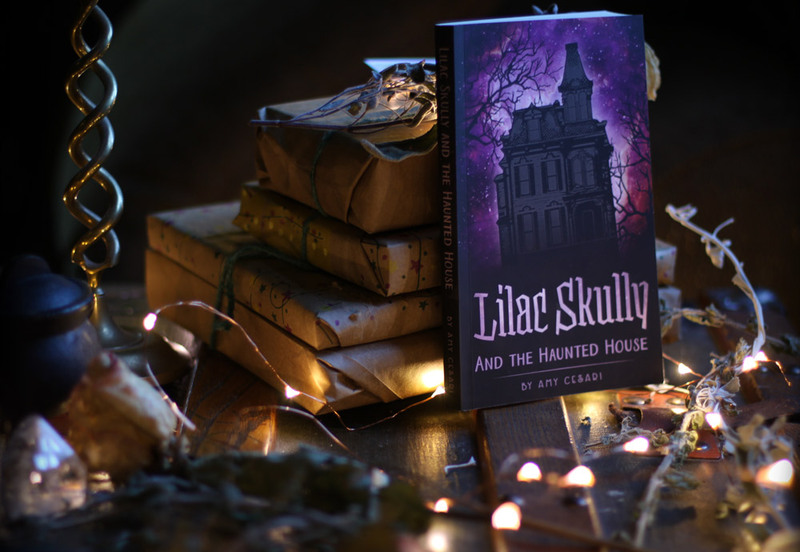 Lilac Skully and the Haunted House worth picking up, and something you can let them read on their own, or read with you each evening. Thanks so much, Lilyn! Glad you liked the book! This website uses Amazon Affiliate links to recommend spooky, fun books you might enjoy. Haunted Cookies that follow you home? Please read our Cookies Policy here. Get A Free eBook Guide to Haunted Steamville!